Bakelite dial base knob. 0-100, 90°-180°. 2 set screws. Brass insert. 0.375" bore. 2.351"D skirt. 2"D fluted knob. 0.887"H. Recessed top 0.176"D x 1.81"ID for dual stack. 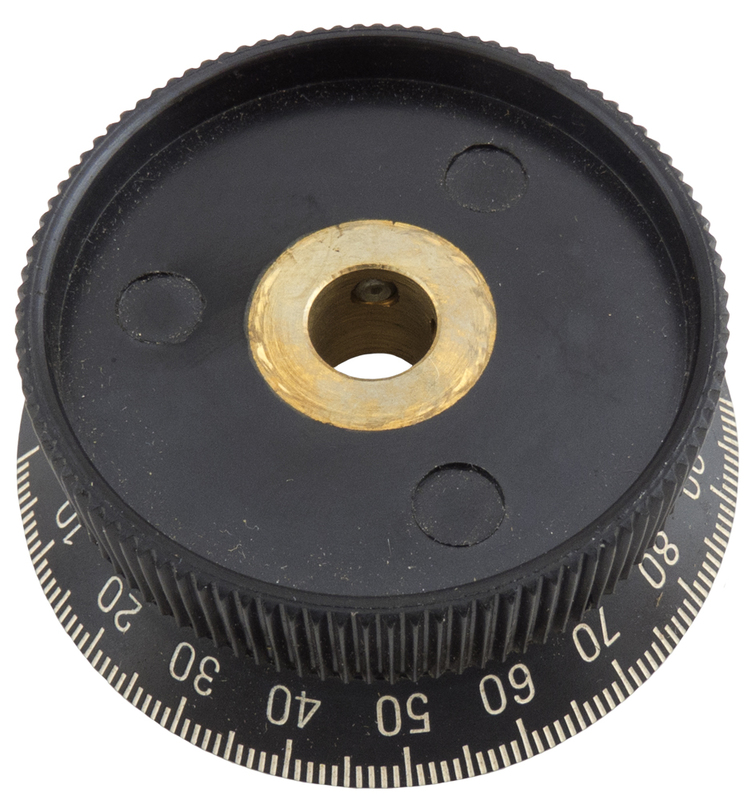 Bakelite black skirt knob. Bottom half of dual concentric shaft set. Brass insert. 2 set screws. 1/4" bore all the way through. 1" knob diameter. 1-3/8" skirt with white pointer. 3/4" high. 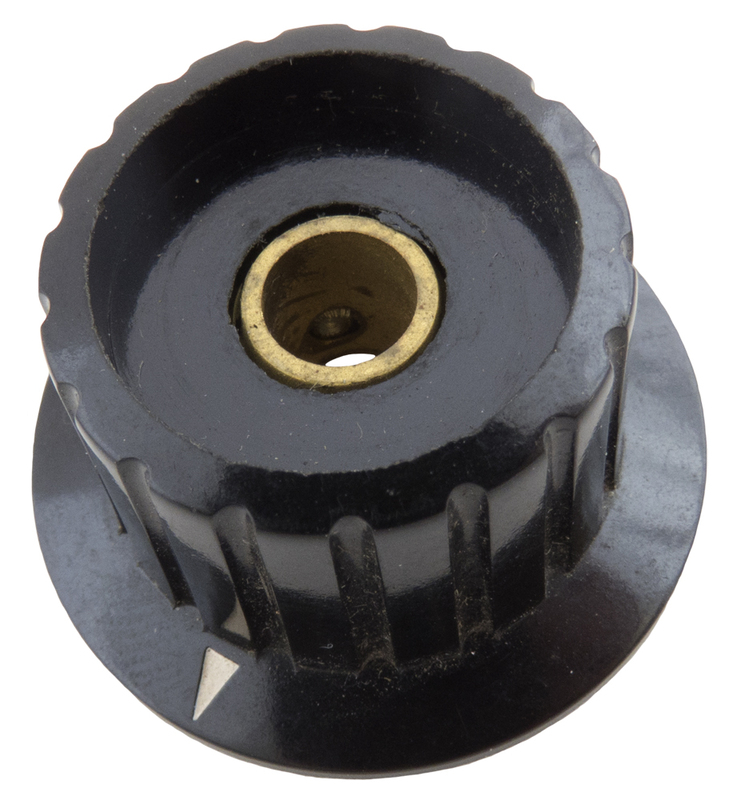 Use 0.75"D, 1/8" bore knob for inside position. Bakelite knob winged with pointer and skirt. Bottom half of dual concentric shaft set. Brass insert. 1/4" bore all the way through. 1" knob diameter. 1.37" diameter skirt. 0.768" high. 1.633" wing diameter. 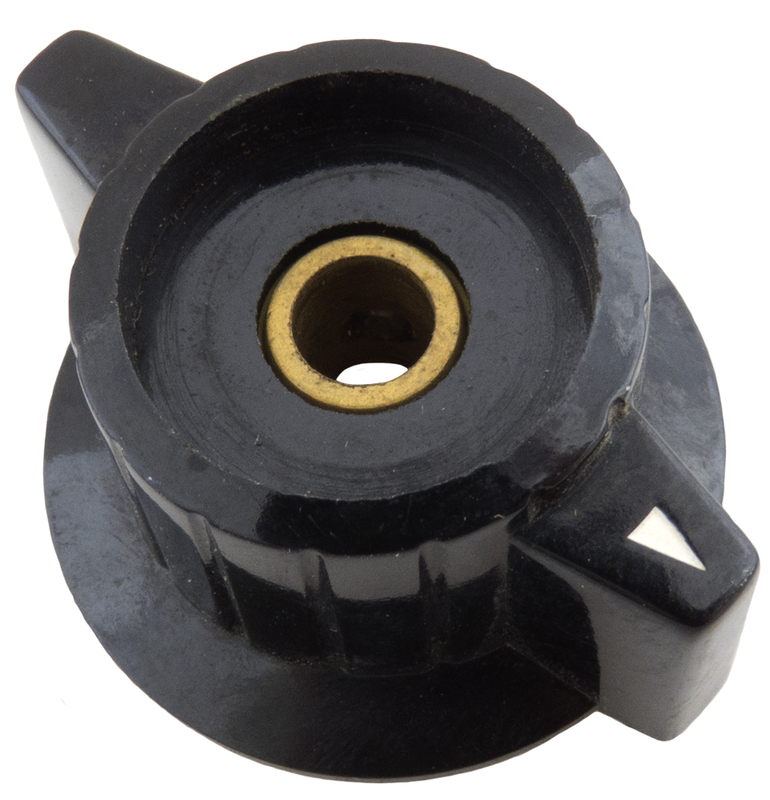 Use 0.75"D, 1/8" bore knob for inside position. See (KNB) 204 for matching pointer. 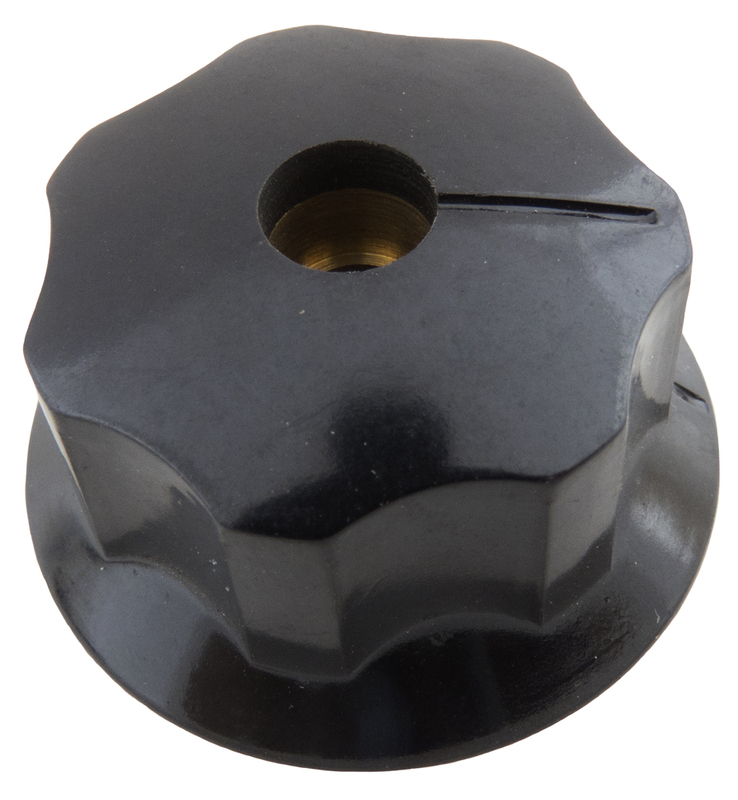 Ohmite black phenolic knob. 2 set screws. Brass insert. 1/4" bore. Bore goes all the way through. 1-1/2" skirt. 1-1/4" knob. 3/4"H.
Dual-stacked knobs for 3/16" split shaft and 1/4" notched shaft. 1-1/8" outside diameter. 7/8" high. Dual knob set for concentric shaft. Red / black. 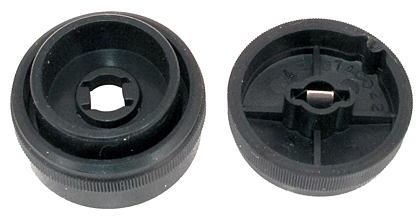 Dual knob for concentric shafts. Aluminum inset trim. 1-3/8" high. Base knob 7/8" diameter, top 11/16" diameter. Collins KWM-380 dual knob set for concentric shafts. Aluminum inset trim. 1-1/8" high. Base knob 7/8" diameter, top knob 11/16" diameter. Bottom knob of 2 knob stack. Black plastic. Pointed indicator, rooster tail. Single set screw. 1/4"D thru-hole. 0.713"D x 1.24"L, 0.607"H. New!! Bottom knob of 2 knob stack. Black plastic. Index pointer. Fluted sides. 1/4"D bore, (0.158") spring. Bore goes all the way through. 0.727"D x 0.582"H.
Bottom knob for dual stack, dual flat shaft. Black plastic. Indexed with painted indicator. 0.265" max width on bore. 0.195" (4.9mm) minimum width thru-hole bore. 0.939"D x 0.383"H.
Bottom Knob for Dual Stack E.M.C. Bottom knob for dual stack E.M.C. 1/4" bore allen insert. 2 set screws. 0.719"D x 0.693"H. Fluted sides, black plastic.